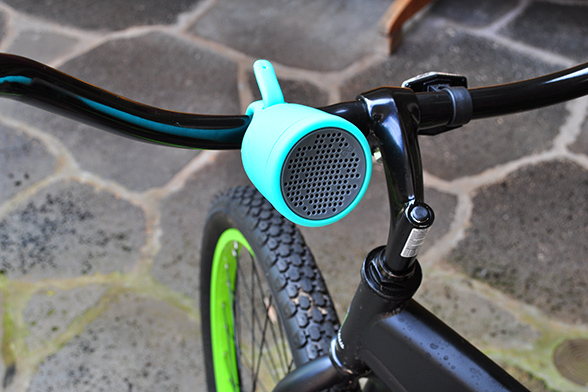 The Boom Movement Swimmer waterproof bluetooth speaker is designed to go anywhere with you. Lightweight, simple but very clever, the “tail” of the Swimmer wraps around a large variety of objects, as stationary as your shower head and as mobile as the handlebars on your bike. We filmed the Boom Swimmer attached to a water aerobics dumbbell floating in a pool. The beautiful music you hear coming from the Boom Swimmer speaker is just a portion of the song “Solemnity” written by Richard Sherman. It is played here with Richard Sherman on piano and Adam Cohen on bass. You can hear the entire piece here on Richard’s site. Boom Movement provides an interesting video about the creation of the Boom Swimmer speaker. 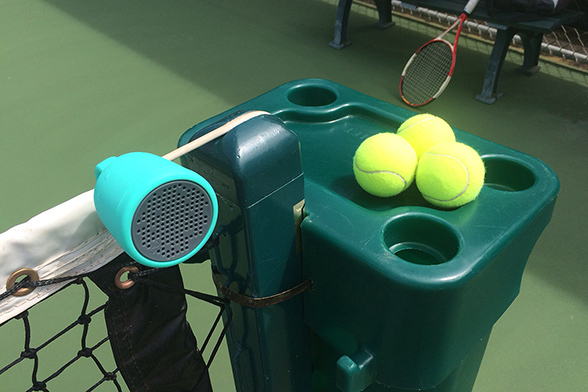 Here’s another video by Boom describing the Flexible Tail of the Swimmer Bluetooth Speaker. 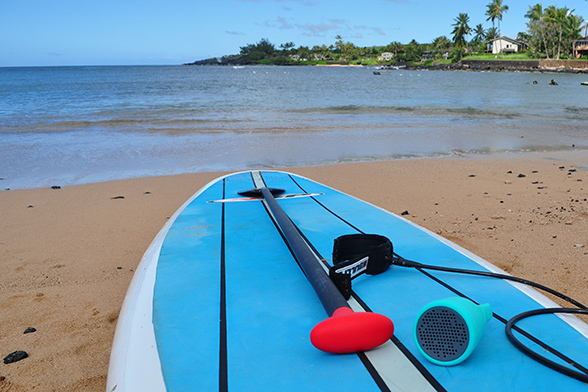 If you are taking your Boom Swimmer Speaker out into the ocean, your speaker is waterproof – but your phone isn’t. So the Lifeproof waterproof case is a great companion of this waterproof speaker. 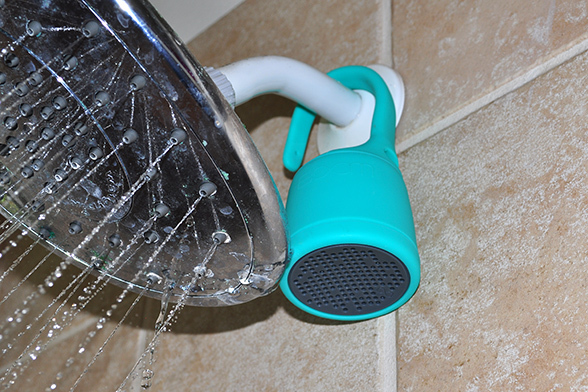 If you are using it in the shower, the Bluetooth technology allows you to put your phone at up to a 100-foot safe distance from the shower. 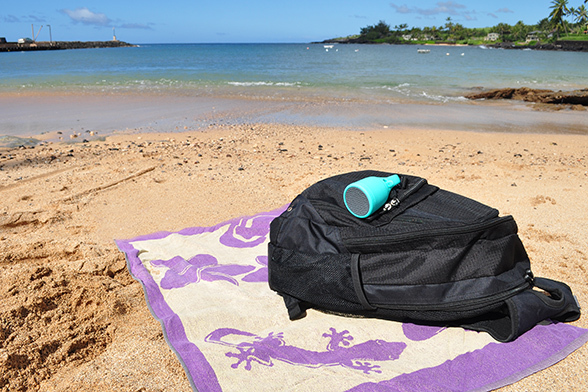 Whether you are hanging out at the beach, on a camping trip, or on a long bike ride, you don’t want to have to worry about recharging. The Swimmer rechargeable lithium-ion battery lasts 16 hours at half volume – or eight hours at full volume – on a single charge. In terms of stand-by charge, I found it still had power after three weeks of not using it – even though I had not turned the unit off. I found it very easy to follow the directions to charge the Swimmer and to pair the speaker with my iPhone. The speaker talks to you to confirm you have successfully paired it to your mobile device, and when you power on and off. 2.5 x 2.6 inches or 63.5mm x 66mm. We think that $60 – $65 is an excellent price for this speaker. The sound is not astonishing but it is more than adequate. We played Solemnity (featured in the Boom Swimmer video above) from the the composer’s website on my iPhone 5s to the Swimmer. We did not hear any distortion from the piano nor the upright bass, even with the volume turned all the way up. 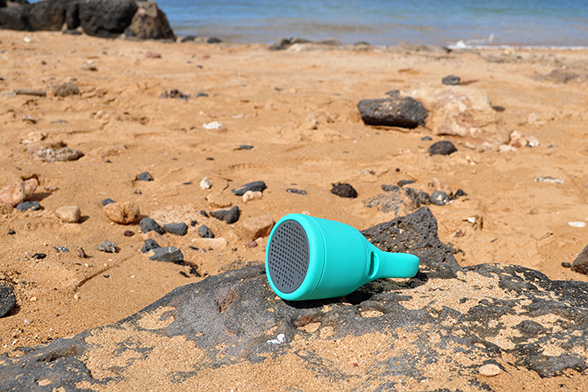 The speaker can be turned up loud enough to be easily heard above the water from a shower. We used it just with the tail and not with the suction cup. The suction cup is said to increase the bass, but we were having too much fun with the tail. Confirmed buyers on Amazon had nothing but good things to say about the Swimmer. Both Boom Movement and its parent company, Sound United, DEI Holdings, are based in Southern California. Usually, our reviews include mentions of failings or downsides to the products. In the case of the Boom Swimmer, we couldn’t think of any worth mentioning. It’s simply a great portable bluetooth speaker that’s available at a very reasonable price.